Trevor Stanley Bird was born in Donald, Victoria on 27 August, 1949. Growing up in Donald a small country town in north western Victoria he developed a love of electronics and radio in particular. The local radio and TV serviceman was a great source of knowledge, and he spent many hours in his workshop. Later he was able to repay the debt by giving him his first holiday in over ten years when he ran his business for three weeks during a university summer vacation. I was fortunate to come into contact with two remarkable academics, Arthur Ferguson and Don Hewitt. They were remarkable because they were excellent teachers, had wonderful people skills and hardly published a paper. They provided inspiration and support at various stages to myself and several internationally known researchers. I must have been destined to work in radio. In 1969-70 during a summer vacation at the Australian Post Office Research Laboratories, I was a witness to the first domestic Australian satellite tests between Melbourne and Brisbane in February 1970. After completing his PhD topic in the area of integrated optical circuits, he went to the UK with the intention of doing a PostDoc in fibre optics. When he arrived he found that Queen Mary College was reducing its effort in this area and the funding for a PostDoc was in satellite antennas, for next-generation systems that followed the pioneering years. He considered this his good fortune. In the UK through contacts in Europe I was exposed to many new ideas in satellite communications and radio astronomy. When I returned to Australia in 1978, the first generation AUSSAT (now Optus) satellites were being-planned. AUSSAT had overseas experts assess the technical merits of the bids. European engineers were asked to assess the various parts of the system including the antennas, as I heard later. They were surprised because some of the leading technical experts in the area were in Australia! His Postdoctoral Research Fellow at Queen Mary College, University of London, was from 1976 to 1978 followed by five years as a Lecturer in the Department of Electrical Engineering at James Cook University of North Queensland. During 1982 and 1983 he was a consultant at Plessey Radar, UK. He joined the CSIRO Division of Radiophysics in Sydney in December 1983 and held several positions there rising to Chief Scientist in the CSIRO ICT Centre and being appointed a CSIRO Fellow. He is also an Adjunct Professor at Macquarie University, Sydney. He was responsible in the late 1980s (with others) for showing that computer-based methods could halve the antenna part of the Satellite industry’s cycle-time, one of the slowest parts of the cycle, from four to two years. For over ten years, he led collaboration worth several million dollars with the world’s largest satellite provider. He applied techniques from the satellite industry to radio astronomy, which resulted in multi-beam feed systems for the Parkes, UK and USA radio observatories. He led the introduction of multi-beam earth stations worldwide, particularly with both transmit and receive capability. The research group that he established in 1989 has been very successful group and gained world recognition in antenna R&D. See also Antennas for radio telescopes and satellite communications. 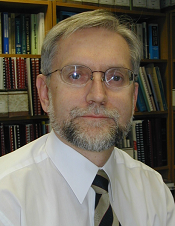 He was appointed Editor-in-Chief of the IEEE Transactions on Antennas & Propagation in 2004, the first non-US based Editor since the journal began over 50 years ago. He has published widely in the area of satellite communications, wireless and radio telescope systems. (As of 2009: 12 patents, 6 book chapters, 82 journal articles, 150 peer-reviewed conference papers, 49 papers with abstract only, 107 research reports.) He is well-known internationally for his contributions to reflector antennas, multiple beam antennas, and arrays, particularly the interaction (mutual coupling) between closely-spaced antennas. Development of a theory of mutual coupling in horn arrays, which was applicable to communication satellite design. In the 1990s, the theory and associated software was instrumental in AUSSAT (now Optus), Galaxy and Orion satellites meeting demanding shaped beam specifications. Mutual coupling is the interaction between closely spaced antennas and its affect on systems performance can be detrimental if neglected. For this work he was elected an IEEE Fellow. Development (with others) of a new type of compact horn for providing efficient illumination of the earth from a geostationary satellite and also for reducing interference through antenna sidelobes. A paper describing this horn received the prestigious H.A. Wheeler Prize of the IEEE in 2001. He was team leader and technical contributor to the development of a new software package for analysing reflectors, feed antennas and supporting structures which was a key design tool for Boeing Satellite Systems (USA) in the late 1990s. He designed the multibeam feed array for the Parkes radio telescope and showed that the gain loss for off-axis beams is acceptable and mutual coupling between the 13 horns could be minimised. This feed system was responsible for the discovery of 1 000 new pulsars and made Parkes one of the world-leading radio telescopes in the past ten years. For this research, he received (jointly) a second CSIRO Medal in 1998. Based on the Parkes experience, he designed other multi-beam feed systems for the Lovell (UK) and Arecibo (US) radio telescope. See also Pulsar surveys and the discovery of the double pulsar. Designed optimum feed arrays for the Galaxy HS601C satellites (launched Oct. 1993). Project leader for the design and test of the prototype antenna for the Western Australia beam on the second generation AUSSAT (now Optus) satellites (first one launched in 1992). In 1996, he conceived the Ka-band communications link project, with Assoc. Professor S Reisenfeld, (University of Technology, Sydney), for FedSat, a low earth orbit microsatellite of the CRC for Satellite Systems (CRCSS). The Ka-band link demonstrated future high-speed communications via satellite for rural and remote communications in Australia. The team achieved a number of firsts for a microsatellite; the first Ka-band transponder, the first space-borne use of GaAs microwave integrated circuits at these frequencies and the first fully space-qualified Ka-band system based significantly on off-the-shelf components. He led the conception and development of CSIRO’s MultiBeam earth station antenna from 1987 until commercialisation in 2006. The project resulted in four patents, a registered design, computer software and designs. Five 4.5-m diameter MultiBeam antennas are in operation at two sites in Europe ‘ three at SES-ASTRA, Europe’s leading direct-to-home satellite system, in Luxembourg, and two at Danish Radio, Copenhagen. One of the latter is the first operational commercial two-way (i.e. both transmit and receive) multibeam antenna. The technology was successfully licensed to the US antenna company Patriot in early 2007. CSIRO received an award from Society of Satellite Professionals International for Technology Development and Application in the public sector category for the MultiBeam antenna. Excellence awards were also received from Engineers Australia. Commencing in 1989, he contributed to the research at CSIRO on 60 GHz indoor wireless local area networks (WLAN) and instigated antenna and propagation studies on antennas for millimetre wave indoor WLAN. He made technical contributions to the project through extensions and application of ring-slot antennas for producing scanned beams (a US patent has over 30 citations). A paper on this research received the best paper award from the Institution of Engineers in 1995. See also Wireless LANs. provided a new chapter on Horn Antennas for the new edition of a widely-used antenna handbook. The new edition was published in 2007.
with C Granet, he developed an optimisation method for designing compact, profiled horn antennas with very high performance over wide frequency bands. led the electromagnetic-design efforts for all of the Australian Department of Defence satellite ground antennas from 1990 to 2000, e.g. the design, fabrication and test of a high performance 11-m diameter X-band earth station and its associated feed system in Canberra. This antenna included several new features to achieve the low-sidelobe requirement. A paper on the antenna received the best paper award from the Institution of Engineers in 1996.
he was co-inventor of a compact, lightweight horn antenna with very low sidelobe interference for a satellite application in the Middle East. analysed the reflection at the aperture of a coaxial waveguide used to feed a reflector. supplied software and the design of the outer horn of a dual-band coaxial feed system for the Tasmanian earth resources satellite station. with GT Poulton invented a high performance self-supporting prime focus feed that was used in a range of antennas by MITEC Ltd from 1989 to 1996.
showed that the Miziguchi condition for dual-offset Cassegrain reflectors corresponds to minimum cross-polarization with diffraction-limited antennas and provided the first detailed analysis of the focal-fields of this antenna. Negotiated research collaboration with the Japanese agencies Communications Research Laboratory and NASDA that conducted experiments with the COMETS satellite. CSIRO and CRCSS received a CRL award for this collaboration, which was received by Bird in Tokyo in 2000. Team leader and technical contributor to deliver computer software for designing VHF/UHF broadcasting antennas. A patent resulted from this work. 2017 James R James Lifetime Achievement Award of the Institution of Engineering and Technology for outstanding contributions to the field of antennas and propagation. 2012 MA Sargent Medal, awarded by Engineers Australia Electrical College for highly significant contributions to the science and practice of electrical engineering. His biography is listed in Who’s Who in Australia. Finally, on reflection, I discovered that my research life has been driven by two inter-related growth laws. The first is so called Moore’s law, after Gordon Moore one of the founders of Intel. This law is often interpreted as the speed (or density) of electronic chips doubles about every two years. Since the early 1970s when I started my research career, the ability to solve useful physical problems by computer (and mathematical methods) has improved enormously. The second growth law relates to the use of wireless communications; the frequency used for this mode of communication has been increasing roughly at a rate of a factor of 10 every 20 years. It’s important to be aware of some of these larger trends. For example, if the frequency of communication law is followed, then by 2020 say, we could be using signal frequencies in the sub-THz i.e. around a million million Hz. The size of sub-THz systems is minute, measurable in fractions of mm, so this raises some interesting research questions as well as applications. Back in the early 1990s, a group of us at the old Division of Radiophysics did a similar fore-sighting exercise at a frequency of 60 GHz for indoor wireless communications. The end result was a patent by some of my colleagues that now underpins most of the wireless local area networks in worldwide use today. The frequency actually used is about a factor of ten lower than our initial work. This did not matter. It prompted ideas and thinking far ahead of its time. So it has to be in the future.